Endoscopic Endonasal Dacryocystorhinostomy (DCR) is the best, scar free (No scar), lacrimal surgery performed for restoration of tears flow into the nose from the lacrimal sac, when the nasolacrimal duct (tear duct) has become blocked (Blocked tear duct / Tear Duct Obstruction). Abnormal tearing or Epiphora (Watery Eyes) takes place due to obstruction in the drainage system of the lacrimal apparatus (Blocked Tear Duct). This disables normal tear drainage into the nose. As a result of the stagnation of tear fluid, there may occur recurrent infection. The endoscopic endonasal dacryocystorhinostomy surgery, which includes fistulization (Creating a direct opening) of the lacrimal sac into the nasal cavity, may relieve the symptoms. The operative approach to the sac in endoscopic dacryocystorhinostom is through the nose. Endoscopes are used in this approach. External Dacryocystorhinostomy: A small incision is made on the lateral side of the nose / medial side of eye and some bone is removed to make a link to the nose. To prevent the closure of the gap, the drains are left behind and removed after few months. 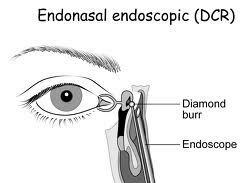 Endonasal: Endoscopic Dacryocystorhinostomy approach can be followed for this surgery. In this surgery, there is NO external incision and so no scar is seen. The surgery is performed through the nose, where an opening is fabricated in the lacrimal sac, from inside the nose. Success rates of endoscopic dacryocystorhinostomy (dcr surgery) remain much inferior to external dacryocystorhinostomy. It permits a one-stage procedure to also rectify any related nasal pathology that may be cause of the surgery. It sustains the pumping mechanism of the orbicularis oculi muscle. It keeps the medial canthus and/or pathologic scar formation away from any damage/trauma. It requires skillful training in nasal endoscopic surgery. The equipment used for endoscopic approach is expensive. Success rates of endoscopic dacryocystorhinostomy (dcr surgery) remain much inferior to external dacryocystorhinostomy. Atopic rhinitis is an outright contraindication. In case of elderly patients, who are in the age group of 70 years and above, Dacrocystectomy may be preferred to Dacrocystorhinostomy, as old age may cause natural atrophy of nasal mucosa. Usually the surgery is performed under general anesthesia. The main benefit of the endonasal DCR or internal approach is that the skin scarring is absent. The nasal mucosa and middle turbinate are first decongested for vasoconstriction and hemostasis. Using a nasal endoscope for visualization, the lateral nasal mucosa adjacent to the lacrimal sac is then incised vertically and elevated. The sac location is typically located anterior to the anterior aspect of the middle turbinate along the nasal wall. A fibreoptic endoilluminator, as used in vitreoretinal surgery, may be inserted through the canaliculi into the sac in order to help transilluminate the lacrimal bone medial to the lacrimal sac if needed. Full exposure of the bone adjacent to the lacrimal sac is needed. Wide elevation of the nasal mucosa is performed with Freer elevators, and the mucosa removed with endoscopic forceps. The lacrimal bone is next removed with a high-speed drill, Kerrison rongeurs, or pituitary rongeurs. Lasers have been used as well. The final bony ostium should be approximately 8mm in height and comprise of adequate clearance of the common canaliculus internal ostium and the inferior sac to avoid persistent accumulation in the inferior sac (lacrimal sump). After bone removal, the lacrimal sac mucosa is infiltrated with local anesthetic for vasoconstriction, incised, and the medial sac mucosa removed with forceps. Adequate lacrimal sac mucosal removal is confirmed by free flow of saline or fluorescein from the canaliculi through the nasal ostium, or direct visualization of the common internal punctum with the endoscope. Bicanalicular silicone intubation may also be placed as in the external DCR approach, and removed postoperatively in the office. Mitomycin C, an antimetabolite, may judiciously be applied to the intranasal ostium to modulate fibrosis. The endonasal DCR is contraindicated for patients with a suspected lacrimal system neoplasm, or lacrimal sac diverticulae, lacrimal system stones, common canalicular stenosis, and severe midfacial trauma. Hemorrhage – Minimize by adequate anesthetic vasoconstriction, cautery, and bone wax. Avoid excessive cauterization of the nasal mucosa that could induce scarring.